Emperor Ninkō (仁孝天皇, Ninkō-tennō, 16 March 1800 – 21 February 1846) was the 120th emperor of Japan, according to the traditional order of succession. Ninkō's reign spanned the years from 1817 through 1846. 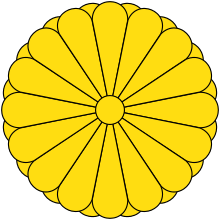 Before Ninkō's ascension to the Chrysanthemum Throne, his personal name (imina) was Ayahito (恵仁). Ninkō was the fourth son of Emperor Kōkaku. Ninkō's Imperial family lived with him in the Dairi of the Heian Palace. This family included 7 sons and 8 daughters from various concubines, but only the future Emperor Komei (Komei-tennō), Princess Sumiko (Sumiko-naishinnō) and Princess Chikako (Chikako-naishinnō) survived beyond childhood. He reigned from 31 October 1817 to 21 February 1846. Ninkō was named as crown prince in 1809, being adopted by the chief wife (chūgū), of his father, the Emperor, Imperial Princess Yoshiko (?, 欣子内親王), also known as Shin-Seiwa-in (?, 新清和院). Ninkō was enthroned as Emperor in 1817 after his father retired from the throne. Following his father the Retired Emperor's wishes, he attempted to revive certain court rituals and practices. For example, Ninkō and all other emperors after his father have been identified as tennō. His reign saw some deterioration of bakufu power. The bakufu encountered yet more problems during the reign of his son, Emperor Kōmei (Komei-tennō). 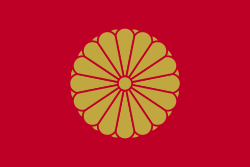 The bakufu collapsed in the beginning of the reign of his grandson, Emperor Meiji (Meiji-tennō). Among Ninkō's innovations was the establishment of the Gakushūsho (the predecessor of the Gakushūin for the Court Nobility just outside the Imperial Palace. After Ninkō's death in 1846, he was enshrined in the Imperial mausoleum, Nochi no Tsukinowa no Higashiyama no misasagi (後月輪東山陵), which is at Sennyū-ji in Higashiyama-ku, Kyoto. Also enshrined in Tsuki no wa no misasagi, at Sennyū-ji are this emperor's immediate Imperial predecessors since Emperor Go-Mizunoo – Meishō, Go-Kōmyō, Go-Sai, Reigen, Higashiyama, Nakamikado, Sakuramachi, Momozono, Go-Sakuramachi, Go-Momozono and Kōkaku. The shrine complex also encompasses the misasagi of Ninkō's immediate successor – Kōmei. Empress Dowager Yoshikō is also entombed at this Imperial mausoleum complex. Following the abdication of his father, Emperor Ninkō ascended to the Chrysanthemum Throne on 31 October 1817. 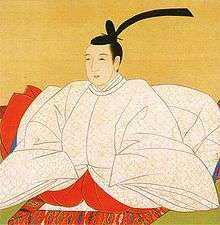 His reign coincided with what is referred to as "the late Tokugawa Shogunate" period and in particular the beginnings of the decline of the shōgun, or bakufu (幕府). Although the final fall of the Tokugawa shogunate only came about during the Meiji Restoration and as a result of the opening of Edo-era Japan to the Western world, it was not simply their inability to cope with the situation that was their undoing. In the mid-19th century a complex political struggle was already forming between the bakufu and its critics. From the outset, the Tokugawa attempted to restrict the accumulation of wealth by families and had promoted a "back to the soil" policy, making the farmer, as the ultimate producer, the ideal person within society. However, as a result of a combination of a long period of peace; better crop production, transport, housing; and in increase in entertainment and leisure time, the standard of living of the average rural dweller rose, despite efforts to restrict wealth. A high rate of literacy, resulted in cultural values being redefined and infused amongst both the samurai and chōnin (merchant-class). Although the government tried to restrict the merchants, seeing them as unproductive members of society, the samurai relied on the chōnin for supplies and were thus converted to the chōnin's cause. This resulted in a struggle between the shōgun and the merchant class, as a result of the political limitations that the shōgun imposed. The cumbersome government bureaucracy could not adapt to the new emerging social order, which was compounded by rapid population growth during the same period. (The 1721 census listed 26 million commoners and about 4 million members of samurai families). Droughts, peasant unrest and mass protests over taxes and food shortages became common occurrences. Previously wealthy families, now landless, were forced to become tenant farmers, whilst the cities' populations grew as rural poor moved into them. A new, wealthy farming class emerged and many samurai who had fallen on tough times were forced to work for merchants. The years of Ninkō's reign are more specifically identified by more than one era name or nengō. 1 2 Titsingh, Isaac. (1834). Annales des empereurs du japon, p. 421. ↑ Ponsonby-Fane, p. 10; Titsingh, p. 421.